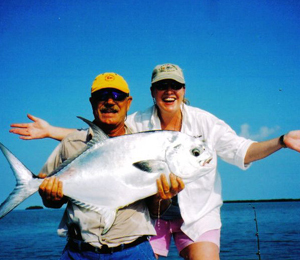 Captain Mike Wilbur has been leading Key West fly fishing charters and spin fishing excursions since the 70's. The Lower Florida Keys in the backcountry are filled with plenty of species of fish that are all worth the time it will take you to catch them. Captain Mike has had a chance to guide beginner fishermen and old, seasoned professionals during the years, yet he doesn't seem to have a favorite type of angler to fish with. Instead, he remains enthusiastic and excited with each new person he meets and takes on his boat. Captain Mike has a lot of fun doing what he does and it shows! You will have a chance to catch some area favorites like Tarpon, Permit, and Bonefish. Of course, there are Redfish, Yellowtail Snapper, and Jacks out there with your name on them if you are looking for something different. The adventure could even go a step further as you attempt to land a shark or a barracuda. Prepare yourself for a great time when you schedule a trip with Captain Mike and the Chaser fishing charter in Key West. All of the most important items you will need, such as poles, bait, and tackle will be provided for you. The only things you might want to bring are some snacks, your favorite beverage, white soled shoes, sunglasses, and sunscreen. Once you have everything you need, your fishing expedition with Captain Mike can begin. You will be sure to create many memories that last when you travel on the Chaser Fishing Charter in Key West. Fish Key West Guides is always interested in your tour experience with us. We hope you enjoyed your tour and love to hear comments. I have been to the Bahamas many times, but Chaser Charters is one of my favorite trips! It includes everything that everyone should do here. As a Bahamas veteran, I can say only the best about this experience!